A comfortable maternity clothing should also include designs that can be worn outside and protect expectant mother from cold and other unexpected weather conditions. 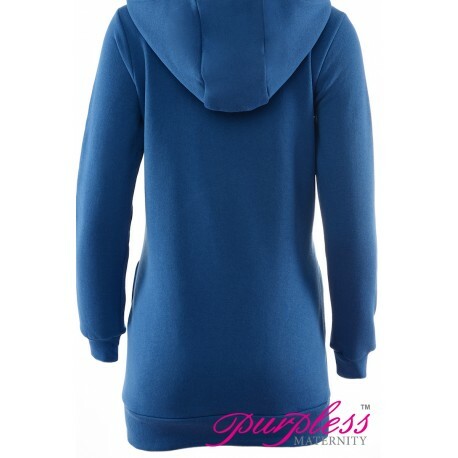 That is why our company took time and effort to design the best maternity cardigans and hoodies for mums-to be who value both utility and looks of their apparel. We provide everything, from simple, yet beautiful ponchos, through maternity cardigans, ending with comfortable and sporty maternity hoodies for ladies who like staying active during their pregnancy. A huge variety of cuts and colours of our maternity clothes guarantee you’ll find something that matches your personal taste. Hoodies & Cardigans There are 99 products. Maternity Cardigan 9001 Royal Blue Look stunning and feel good in this fabulous warm maternity cardigan. Designed for mums-to-be to keep their bump warm during cold winter days. Two button fastenning, you can wear it with long sleeves or 3/4 sleeves.Ideal for going out, casual and smart occasions.Stylish and modern design. Maternity Cardigan 9001 Black Look stunning and feel good in this fabulous warm maternity cardigan. Designed for mums-to-be to keep their bump warm during cold winter days. Two button fastenning, you can wear it with long sleeves or 3/4 sleeves.Ideal for going out, casual and smart occasions.Stylish and modern design.